Montemerano, a small village that smacks of the old country, located in a part of Southern Tuscany that is still unchartered territory. It’s not often you find that incredible mix of undisturbed medieval beauty and tourist-free authenticity. Montemerano is lived, loved and proudly preserved by the locals, from its gorgeous streets to its fresco-covered church and beloved town fete. 147km north of Rome. 186km south of Florence. Map. WHAT MONTEMERANO LACKS in size, it makes up in a charm and grace that could give any of Tuscany’s bigger, better known and utterly oversaturated cities a run for their money. You enter through a small opening in the impressive stone-block wall, passing under a wisteria tree that is probably as old as the village itself. And just like that, you’re transported to a different time, a different century. Montemerano started life most humbly as a 12th century encampment for the Aldobrandeschi family’s soldiers. The Aldobrandeschi were just as debauched as the Borgia and as rich as the Medici, but their penchant for infighting proved particularly destructive. Very little has changed since the soldiers left and the Montemerani, as the locals call themselves, moved in. Under your feet are sand-coloured cobblestone streets worn bare by centuries of foot traffic, while all around you the limestone houses are preened and cleaned by the locals that have lived here for generations. There is nothing ostentatious about Montemerano. You won’t stumble across a breathtaking monument of David or a gargantuan palazzo made from marble, but you will be embraced by a quiet sense of peace that comes from the Tuscan countryside around you, and the self-satisfied knowledge that you have discovered a part of Italy that so many foreigners completely overlook. The best thing to do is wander this small village. Montemerano is as beautiful inside as it is out, and all the laneways lead to the village’s physical and emotional heart, the Piazza del Castello. This is where the soldiers trained under the watchful eyes of their masters. The castle they watched from is gone, but the piazza doesn’t miss it. With its 360° beauty, you’ll have to stop yourself from running to the nearest real estate agent to see how soon you can move in. Find yourself a spot on one of the stone benches and take a moment to watch the locals as they potter about. They still can’t fathom why anyone would want to visit their tiny town, so you’ll most certainly be a topic for discussion, but eventually they’ll move on to the latest and juiciest gossip or a justified rant about the small traffic light that has been desecrating the 12th century wall for the better part of a decade. They still haven’t forgiven their local councillor for it. Heading back onto the main strip, you’ll find a plethora of family-owned restaurants and gourmet stores where the English is terrible, but the pasta is out of this world. If you’re not too full to move, head over to Montemerano’s pride and joy, her Chiesa di San Giorgio. 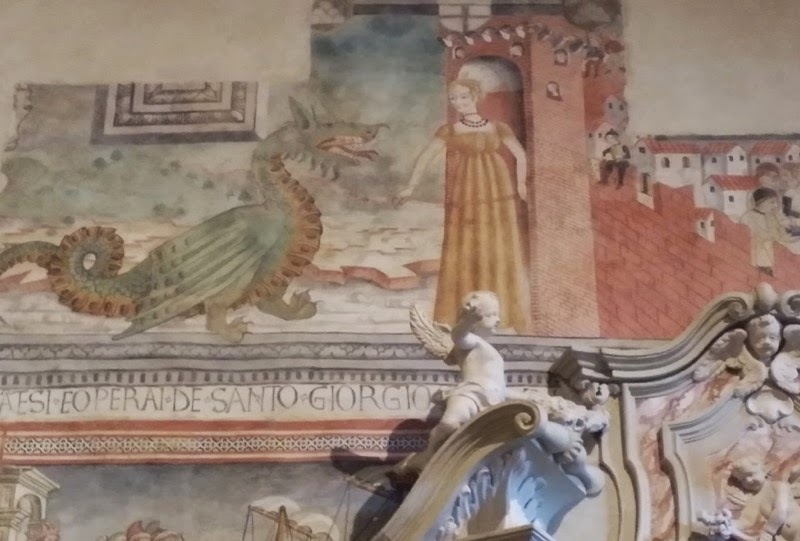 Saint George is the town’s patron saint, a legendary figure who the locals insist did not slay a dragon in, as most stories will tell you, modern day Persia, but in Montemerano. 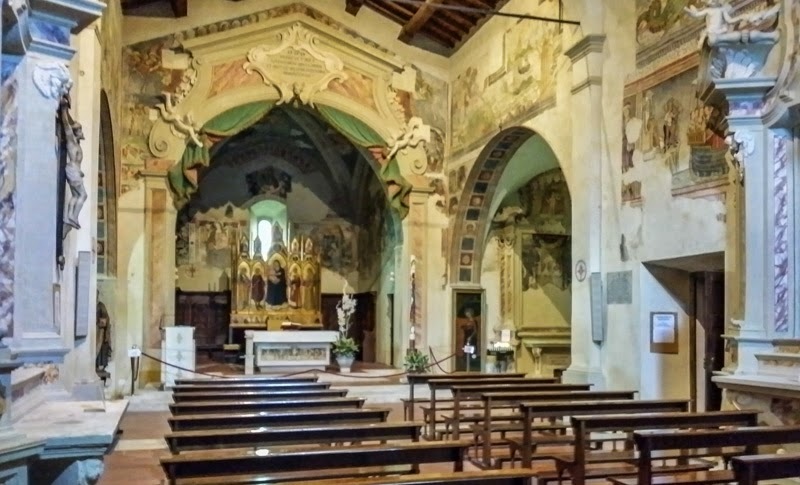 Inside this 14th century church, you’ll find the frescos to ‘prove’ it. Arguably, one of finest, if underappreciated, churches in Tuscany, the Chiesa di San Giorgio is adorned by almost all of its original pastel-coloured frescoes, from the scenes of St George to those of St Ursula leaving her disgruntled husband behind as she embarks on a sea voyage to naked men and women dancing into heaven or toiling with demons in hell. Next to the altar is my favourite artwork, the Madonna della Gattaiola, a beautiful painting of Mary in faded blues, reds and browns. Madonna della Gattaiola literally means ‘Madonna of the cat door’, a name that stems from an old legend. In it, the parish priest finds himself in a bind after storms destroy the door to his granary. He makes do with an old panel with a painting of Mary on it and before he puts it up, he cuts a hole at the bottom so his beloved cat can get in and out. 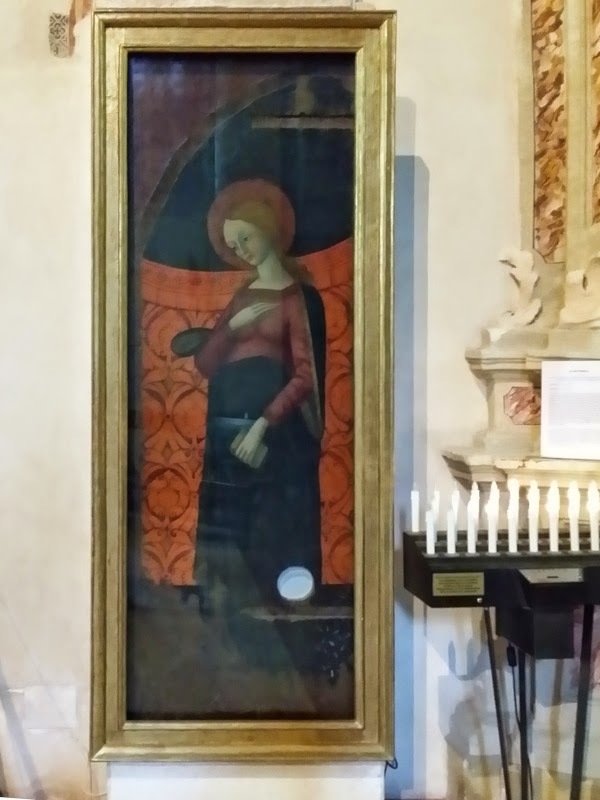 When the locals discovered it was actually a priceless painting, they moved the panel to their church and admonished the priest tirelessly. From bumbling priests to quiet streets, Montemerano has everything you want in an undiscovered destination. So next time you’re in Tuscany, skip Florence, give the other tourists the slip and experience life as a local. 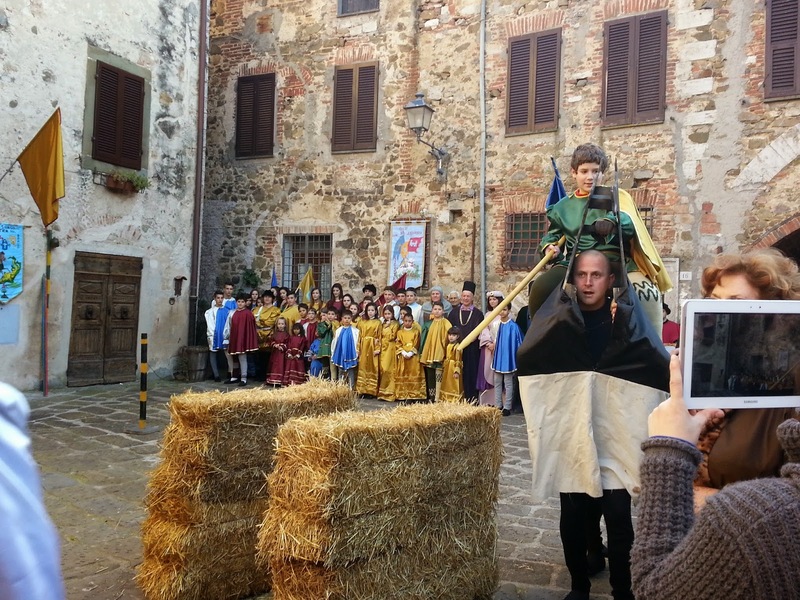 The village comes alive in April for its Festa del Drago, when handsome young men canter through the streets on makeshift horses to save a beautiful maiden from the ferocious dragon. You don’t want to miss it. Navigating the Maremma is difficult with public transport. The nearest train station is in Grosseto. From there you can catch a bus to the municipal capital, Manciano, and then another local bus to Montemerano. The entire trip takes about 70 minutes and costs around €6. Alternatively you can follow the A1 and E35 from Rome or Florence. Elisa is an Australian journalist who came to Tuscany for a year, fell in love, how cliché? And decided to stick around. 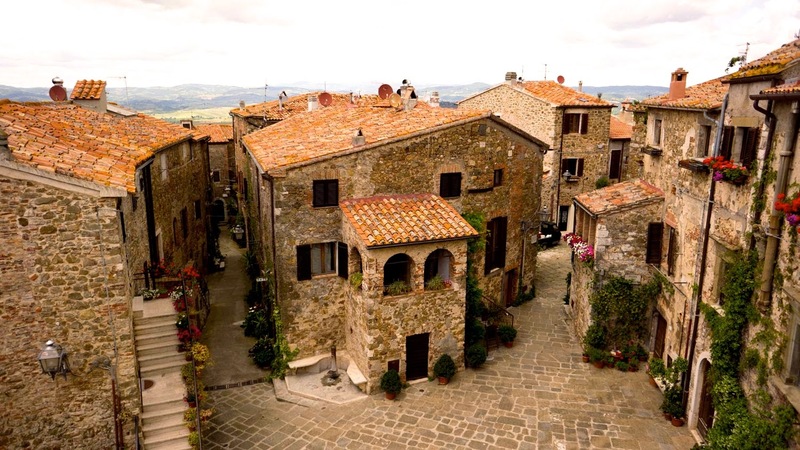 Not one to keep paradisiacal holiday destinations to herself, she now writes a Tuscan travel blog and online travel guide about the infinitely beautiful Tuscan Maremma, so that others can get a taste of la dolce vita.